Join the discussion on our forums! 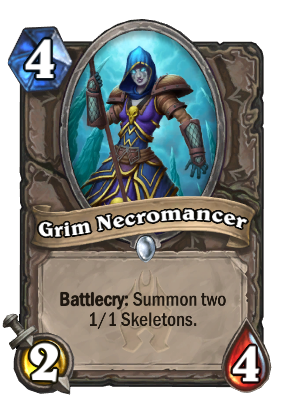 Come discuss Grim Necromancer over in our dedicated Grim Necromancer discussion topic. Second best flavor text of the expansion, only below Skulking Geist. Grim Necromancer - WARNING: Skeletons will NOT explode. Perfect, possibly the best flavor text hands down. This will be an Arena All-star. No doubt about it! Every now and again I try a board-floody kind of deck with Sea Giants. This could be neat there. Just me and Mr. Bitey and Mrs. Bitey! Compare to Nightbane Templar. +1 mana and health, neutral, doesn't require dragon synergy for activation. Just me and Mr. Bitey! Its aight in arena. Not great. 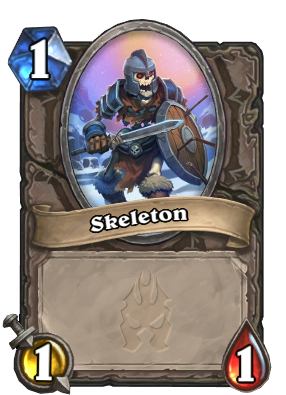 Its very similar to Dragonling Mechanic which is a really bad card.